The Al-Durah hoax is the incident in which the Palestinians claimed that Mohammed al-Durah was killed – deliberately – by the IDF in 2000. I would recommend having a look at The Al Durah Project which has been following the lies, libels and court cases almost from the beginning. (Here is their facebook page, and here is their Twitter account). The incident ignited the deadly Second Intifada and Mohammed al-Durah became an icon of Palestinian victimhood. A French media analyst, Philippe Karsenty, has analysed the videos and conducted many interviews over the years and came to the conclusion that Charles Enderlin of France 2 TV station staged the event. For a long time he was a lone voice in the wilderness, backed up by Richard Landes of The Second Draft and The Augean Stables. Like a lot of people, I like to imagine how the books I read might translate to film. I envision famous actors in the roles of characters, picture action sequences as cinematic spectacle, and – if I’m feeling particularly ambitious – try to figure out how the text could be edited and cajoled to become a two-hour multimedia event capable of being absorbed in a single sitting. I completely failed with this last exercise while reading Max Brooks’ World War Z. Written as a series of distinct accounts collected by a kind of post-zombie war historian, it doesn’t possess a conventional overarching narrative. It’s just a collection of dozens of separate tales cinched together by some meaty philosophical and geopolitical themes that sneakily serve as insightful commentary on real-world mindsets, governments, and even religions. Back in April Salam Fayyad, the Palestinian Prime Minister, tendered his resignation. The resignation comes following major disagreements over government policy in the Palestinian Authority and rumors that Abbas would fire Fayyad, who also serves as finance minister. How can Salam Fayyad’s resignation as Prime Minister of the Palestinian Authority be considered a setback for the peace process when he had never been involved in the negotiations with Israel in the first place? Palestinian Authority President Mahmoud Abbas never consulted with Fayyad about the peace process with Israel. Over the past five years, the two men hardly even spoken to one other. MONTREAL – A frozen yogurt company in the Montreal area has been asked by Quebec’s language police to stop using its disposable spoons. According to a post on Menchie’s Facebook page, in response to a complaint, the The Office quebecois de la langue francaise (OQLF) have asked the spoons to be replaced because of the words “Sweet Moosic” molded into the handle. “We were visited by Office Quebec de La Langue Francaise and they cited us for having English molded in the spoons, apparently responding to a complaint,” Menchie’s said in the post. The incident, which follows on the heels of other language watchdog controversies like “pastagate” and “caffegate,” has caused a stir on social media. A Lakeland photographer is on a mission to change perceptions of breastfeeding. Christine Santos has put together a series of images called “Nursing is Natural” and she’s trying to win an online campaign to raise money to market her exhibit and raise awareness. Santos chose nature to create artistic photos of breastfeeding. This exhibit is a personal journey for the 29-year-old photographer. Misfeasance: While the IRS was hassling any nonprofit group with the word “patriot” in its name, it was rubberstamping exemptions for “Islamic” groups, even organizations that violate disclosure laws. Worse, it was even finding favor with nonprofits tied to terrorism — namely, the Washington-based Council on American-Islamic Relations, which not coincidentally is yoked to the Democratic Party. Despite being blackballed by the FBI, which still suspects it’s fronting for Hamas, and despite failing to file annual tax reports as required by federal law, CAIR apparently has found friends in high places at the nation’s powerful taxing authority. Last year, in the middle of the national election season, the IRS quietly agreed to reinstate CAIR’s tax-exempt status, allowing it to resume raising tax-free donations just in time for Ramadan, a key time for Muslim charitable giving. We are much happier when Google seems to start projects that don’t make strict monetary sense at first. So when we heard that some Googlers went deep into the remote regions of New Zealand, in order to give a handful of people internet, our interest perked up. 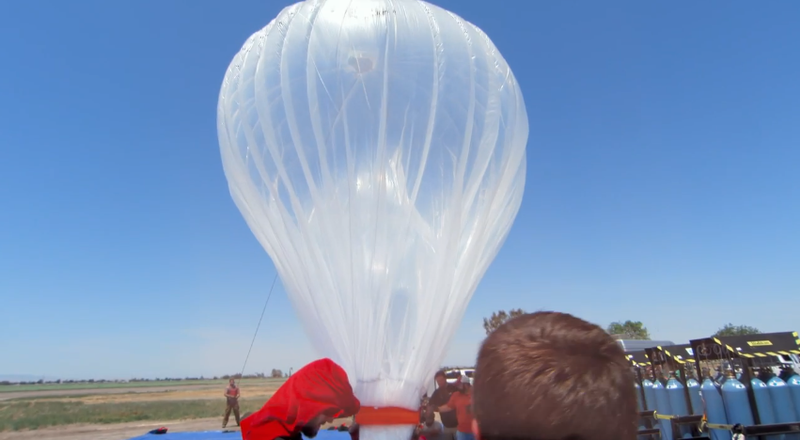 We are not saying that the balloons of Project Loon won’t eventually be the method of choice that delivers internet to the masses; or that launching prototype projects doesn’t make sound business sense. Instead, the reason we like the story so much is not because of these very valid practical considerations.